Dordogne River near Castelnaud-la-Chapelle(© Luc Viatour)Chez Pochou is located in the village of Saint-Aulaye in the département Dordogne. (A département is an administrative division of the French government). The département is named after the river that flows through the region. The region is also referred to as the Périgord. It is a lovely region, with beautiful river valleys, picturesque villages, hundreds of castles, prehistoric caves, delicious food and very good wines. No wonder it makes a fine holiday destination. There is a lot of touristic information about the Dordogne available on the internet, so there is no need to rewrite everything here. You can start with the links provided below. 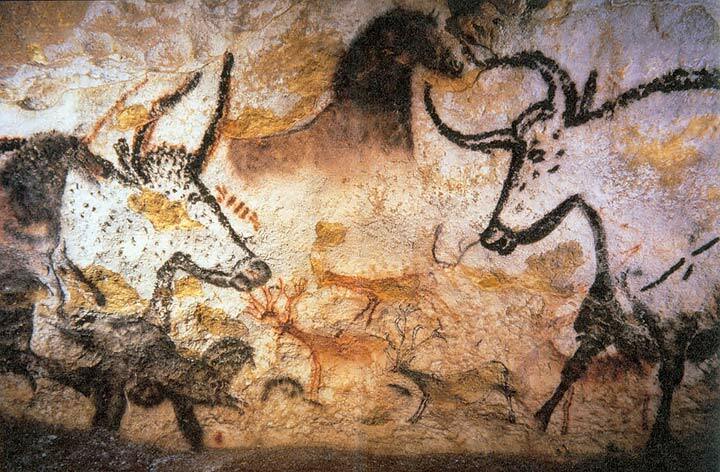 Included are links on the famous attraction of the region, the Lascaux caves, that contain prehistoric paintings believed to be more than 18,000 years old. The caves are a UNESCO World Heritage Site since 1979. And some links are added for those who wish to be physically active in the beautiful region that the Dordogne really is, very much worth while to explore. 12th Century Romanesque church Sainte-Eulalie(© JLPC)The village of Saint-Aulaye is situated on the northern edge of the département Dordogne along the shores of the river la Dronne, across the river is the département Charente. The Saint-Aulaye Castle in the village center dates back to the 13th and the 19th century. The castle functions nowadays as the town hall. The Romanesque church devoted to Sainte-Eulalie of Merida was built in the 12th century; it is an official historic monument; it has given its name to Saint-Aulaye. The village has a nice public beach on a calm branch of la Dronne, with a modest restaurant on site. In the centre of the village there are a restaurant and a pizzeria. Every Saterday morning there is a lively market in the Rue des Faux Christs, where you will be able to buy fresh and local produce directly from producers and artisans. A place to relaxWhether you use Chez Pochou as the base that you return to after exploring the beautiful Dordogne region, or as a place where you want to enjoy the tranquillity all day long, it is always a pleasant place to relax. You may take a dip in the heated pool, sit back and relax under a tree, or make a stroll to the small woodland at the bottom of our land along the little stream le Moudelou. And for children there is ample space to play.